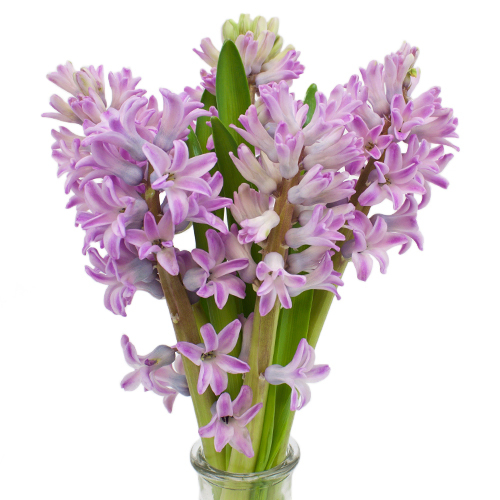 Add an enchanting touch to romantic arrangements with Hyacinth Lilac Flowers. 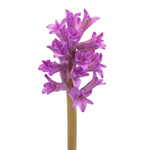 Hyacinth feature unique, star-shaped blooms, which cluster together to look like a single flower. These smaller blooms have a pinky lavender hue, with creamy white accents. Try using for colorful, modern-inspired arrangements. Pair with blooms like premium purple lilac flowers, white bulk tulips, baby hydrangea honeydew green flowers, and speckled violet mokara orchids. Each stem features a cluster of small blooms. This flower is shipped with 5 stems per bunch. The expected vase life is an average of 8 days with proper care and handling. 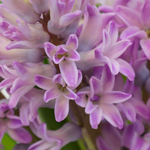 *Hyacinth Flowers have fluctuating availability during the summer wedding season. If your desired delivery date is not available on the calendar, please contact customer care to discuss current availability. Bulk Hyacinth flowers are shipped directly from our farms. Before shipping your flowers, we prepare them for their journey with proper hydration methods. If your flowers appear sleepy and thirsty after their journey, it is absolutely NORMAL. Just follow these simple steps and the flowers will bloom delightfully. Add floral food to prevent bacteria from growing in the water and to give added nutrients to the Hyacinth flowers. If you do not have flower food, it can be purchased at any local florist. Remove any leaves that fall below the water line. Leaves will mold or rot and cause bacteria to form and shorten the flower's life. Allow flowers at least 4 hours to hydrate well. 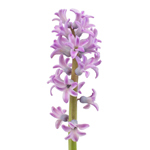 Hyacinth flowers may take up to 12 hours to properly hydrate. Change water every 24 to 48 hours or when the water becomes cloudy to keep flowers fresh. Assure that your Hyacinth flowers have sufficient water. The flowers will drink an exceptionally large amount of water upon arrival. Remember that exposing flowers to warm environments (outside, a hot room, etc) will help the flowers to bloom, and storing your Hyacinth flowers in a cooler environment will slow down the opening process.